I have received the Gibo Gulp gift certificates from the mail on May 1, 2010 (Saturday). A friend has shared to me these Noynoy Gulp gift certificates which I gladly shared to my family, house helpers/ employees and friends. Thank you to my very kind friend and to 7-Eleven!!! a 7-11 person delivered my gulp certificates on motorcycle 3 days after the elections and told us that this promo has been extended. 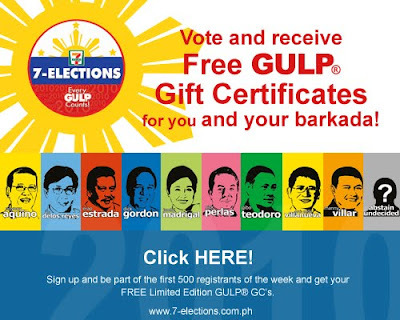 When this was presented to the local 7-11 store near our place,they told us that these were already invalid because the elections were already over. I have received an email on the 1st week of May that the promo has been extended till May 31. Don't throw your GCs. Perhaps the employees of 7-11 branches were not informed of this extension. You can still use them. Thanks.